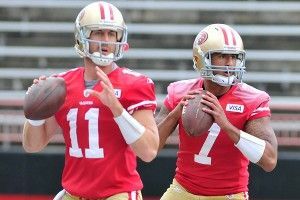 With the ascension of Colin Kaepernick into the starting spot at quarterback for the 49ers seemingly complete, San Francisco is left with a very noticeable backup standing on their sidelines. Although Jim Harbaugh still described him as the starter, Alex Smith’s apparent benching came about almost entirely due to his concussion, as his 70.0 percent completion percentage and 8.0 yards per attempt were both well above league-average. Kaepernick is averaging an unsustainable 9.2 yards per attempt so far, and because he’s likely made more deep throws than Smith would under the same gameplan, his completion percentage (64.9 percent) is a decent spell worse, even if it’s still above league-average. The Niners were able to get Kaepernick work by integrating him slowly into the game plan, giving him about 15 percent of the snaps on most weeks by using the former Nevada star as a run-pass weapon in the Pistol or a standard shotgun. While Jim Harbaugh has maintained that he’ll ride whichever quarterback has the hot hand, a slump from Kaepernick would bring in a cold Smith off the bench. In the same way that he found reps for Kaepernick without creating waves earlier in the season, is there a package with which Smith can get 15-20 percent of the offensive reps and stay warm? I think there is, and it revolves around a term that surprisingly hasn’t made much traction in football: closer. Certain backs have been placed in roles where they were used in what amounted to a fourth-quarter save situation; Ahmad Bradshaw’s run with the 2007 Giants toward the end of the regular season and the playoffs comes to mind. Quarterbacks, though, have never been used in that unique scenario. A closer quarterback would be one who, above all else, made safe decisions with the football and avoided turnovers. That’s Alex Smith’s biggest strength, and while Kaepernick has been mostly sound with his decision-making during his first two starts, it’s the one place Smith is likely to hold an advantage over a second-year player for the time being. Using a closer quarterback would have other advantages, too. It would keep Kaepernick out of the game in run-focused situations in the fourth quarter (unless he’s wanted as a running threat on a particular play), which is a way for him to stay as healthy as possible for more meaningful situations. Since the 49ers win most of the time, it would be a good way to keep Smith fit and fresh for a late-season or playoff scenario in which Kaepernick gets hurt or needs to be benched. And just as teams needed to devote some time in the film room and on the practice field to stopping Kaepernick after he appeared on the field in a part-time role, they would actually have to sit down and study what Smith can do in his new role and devote valuable practice reps to stopping that relatively tiny part of the San Francisco offense. If Harbaugh was able to carve out a slight role for Kaepernick when he was an afterthought heading into the season, it might make sense that he would do so for his previous starter, too. The downside is that you’d start hearing false concerns that Kaepernick didn’t know how to “close out games,” a skill that doesn’t actually exist. If Kaepernick did begin to struggle, it’s possible that 49ers fans might instantly start hoping for Smith to take over as the starter again, but considering they’re only a couple of years removed from chanting “We Want [David] Carr” at him, it’s probably safe to think that the vast majority of them are comfortable with him remaining exclusively in a relief role. I don’t know that I’d recommend that most teams go out and find a closer with which to supplement their current quarterback; heck, I don’t think it’s necessarily a great idea for the 49ers to do so, either. But if you were going to create a package of plays for Alex Smith that were built around his strengths and designed to keep him warm while helping the team win, well, that package would create football’s first closer. The numbers for Ryan Tannehill this past Sunday look pretty good. After a slow start, Tannehill had an enormous second half against the fearsome Seattle pass rush (and their purportedly Adderall–high jinks–friendly set of starting cornerbacks), going 11-of-15 for 185 yards. He also scrambled for 33 yards, including a key scamper on the game-winning 65-yard drive that kept Miami’s playoff hopes alive. All in all, you can’t ask much more from your rookie quarterback than that, and Tannehill should be lauded for doing good work against a very tough defense. It’s always important, though, to supplement the numbers with actually watching the game. And while there’s nothing in Tannehill’s statistical line that he doesn’t necessarily deserve, there’s one play hidden amid the numbers that nearly sank Miami’s chances while making me worry about Tannehill’s performance the rest of the way. On the play (at 1:35 here), the Dolphins lined up in an empty backfield in the shotgun on first-and-goal down seven points with 8:20 to go. You don’t need me to tell you what the situation demands here: You likely want to use the lax intentional grounding rules by throwing the ball out of the back of the end zone if you get pressured, and you want to throw the ball out of bounds if you’re outside the pocket and don’t have a clean throw. What Tannehill can’t do in the red zone, especially on first down, is throw up a questionable pass that has little chance of succeeding and a significant chance of being intercepted. Unfortunately, that’s exactly what happens. Tannehill feels pressure and scrambles out of the pocket, and when he can’t find a truly open receiver, he makes a throw that would easily qualify as one of the five worst passes of the year. Tannehill throws against his body, without setting himself, back toward a double-covered receiver in the middle of the field. Even with his strong arm, the throw has such little zip on it that the pass is easily intercepted. Why is the play hidden among otherwise strong numbers? Well, because Tannehill gets bailed out on the play by a roughing-the-passer penalty on Earl Thomas that would be safely characterized as “generous.” The hit didn’t appear to qualify as roughing the passer, but even if you feel that Tannehill was infringed upon, it wasn’t a hit that would have changed the nature of his throw or affected his decision to throw the ball. The numbers and the impact of that bad decision have been wiped off the record, but it doesn’t change the process that Tannehill went through before making the snap decision to throw that pass. Daniel Thomas ran the ball in from three yards out on the next play to tie up the game. You can argue that Tannehill just made a rookie mistake, and that’s fine if you want to characterize the faux pas that way. If you’re going to laud Tannehill for the progress he made with his big second half and his game-winning drive, though, you have to mix in this decision, which nearly changed the game, too. The Dolphins have a good enough defense and a strong enough running game that they might be able to make the playoffs in a down AFC with competent quarterback play; Tannehill might end up being the best quarterback for them in the long run, but right now, rookie mistakes like that are going to hold the Dolphins back from competing.